Professionally installed skylights provide many benefits to Middletown property owners. The most obvious benefit of a skylight installation is the fact that your home or business will have increased natural lighting. This aspect substantially increases you and your family’s enjoyment of your interior living spaces. For commercial properties, it enhances the beauty of your business’s interior. Middletown Skylights also improve ventilation and comfort levels within your property. Lastly, a uniquely designed skylight system beautifies the interior and exterior of your property. When you decide to install a skylight system in your home, it is important to hire a professional contractor that can help you with important decisions. The professional roofing contractors at Serrano II Inc have over thirty years of experience installing skylights. They can help you with all of the important decisions, including by providing you with expert advice about how to maximize the energy efficiency of your prospective skylight system. The following is a short guide as to the important considerations when it comes to installing energy efficient skylight systems. Ultimately, the layout of your Middletown property will affect many of these considerations. The professional roofing contractors at Serrano II Inc can help you customize your Middletown Skylight to maximize energy efficiency in your property. Many aspects of your prospective skylights will have different effects on your property’s energy consumption. The most important decisions to consider involve the size, glazing, and placement of your skylights. The professional skylight installation team at Serrano II Inc can help you make the right choice for all of these aspects. Because the sun’s position varies throughout the day and in different seasons, the directional placement of your Middletown Skylight changes the energy effect on your property. According to the Department of Energy, the size of your room and the number of windows in the room determine the optimal size for your Middletown Skylight. 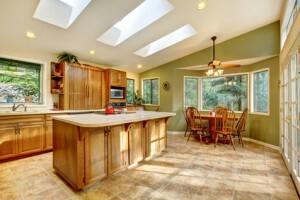 As a rule of thumb, skylights in rooms with many windows should not exceed 5% of the floor space. If the room you are placing the skylight in does not have many windows, your skylight can be up to 15% of the room’s floor space. Because the sun’s position varies throughout the day and in different seasons, the directional placement of your skylights changes the energy effect on your property. North facing skylights provide a constant cool illumination, whereas South facing skylights maximizes heat transfer in both the winter and summer time. The term glazing refers to the translucent window material of your skylights. These materials are usually made of plastic or glass. These materials have different reflective and insulation properties. The expert skylight installers at Serrano II Inc can help you choose the particular glazing material that works best with your chosen skylight size and direction. In this way, you can feel confident that you made the best choice when it comes to energy efficient skylights for your Middletown property. If you need to hire a professional Middletown Skylight contractor, call Serrano II Inc at 845-692-2226, or fill out our online request form.